Be the first in Napier to view Rocketman, the biographical musical based on the life of Elton John. See the trailer below and buy tickets to this great movie. Tickets $25.00 which will include pizza, baking and a drink. To buy tickets contact Nicola on officehbms@gmail.com or for queries phone on 027-240-6621. An event hosted by the Napier Host Lions Club and Hawkes Bay Multiple Sclerosis Society with funds received going to the Hawkes Bay Multiple Sclerosis Society. 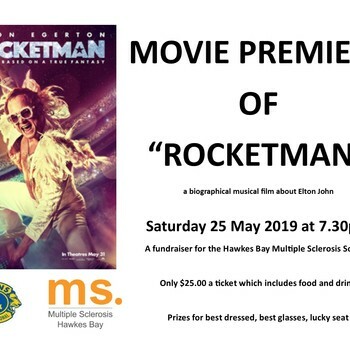 Rocketman Movie Premiere Be the first in Napier to view Rocketman, the biographical musical based on the life of Elton John.